House inside the machine is a selection of Tiffany & Co. fragrances, parked alongside Tiffany Blue wooden crates that display the brand's "Everyday Object" accessories. This location also has a #MakeItTiffany personalization bar, which allows their customers to monogram their favourite pieces. If you don't happen to be near London, you can also create personalized jewellery at their Rockefeller Center in New York City. These efforts to tap into the millennial market have not gone unnoticed. Earlier this year, the brand painted New York subways and taxis in their signature blue, which commemorated the launch of their new collection, Paper Flowers. 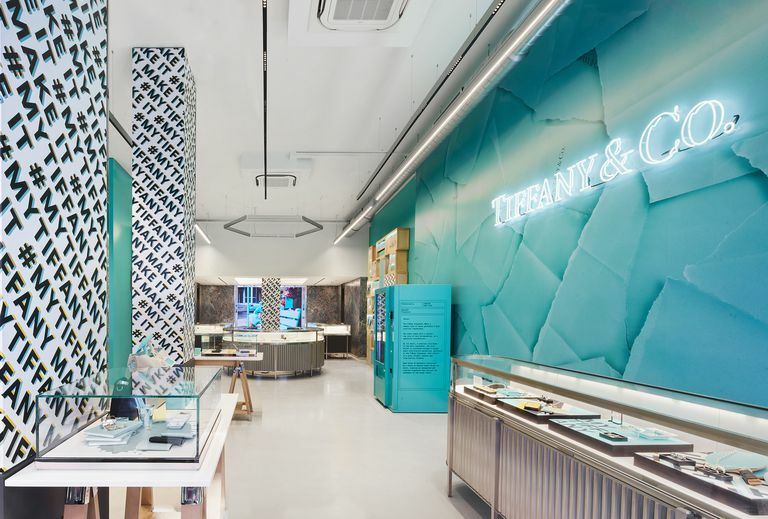 Tiffany has also recently unveiled their Blue Box Cafe on Fifth Avenue, which allows fans and followers to finally have breakfast at Tiffany's.